Two visits instead of one! 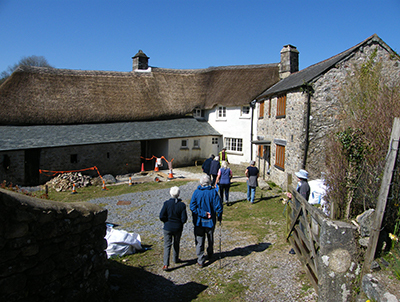 This was the situation on Wednesday 27th March 2019 when we visited the newly restored Higher Uppacott Grade I listed Medieval Longhouse. The original visit was timed for 2pm, however due to a large number of Members wishing to attend, the DNPA kindly agreed to provide a second tour scheduled in the morning at 11.30. The weather was perfect and the views from Bel Tor Corner Car Park where we were all meeting to do car sharing were superb. The restoration of the Longhouse is very much a work in progress and these improvements have been funded by the “Moor Than Meets The Eye” heritage lottery project. Our guide Ralph Mackridge was extremely knowledgeable and escorted us into the “Shippon,” and through the “Hall”, into what is described as “the inner room”. We also saw the “Parlour” and after being split into two groups we made our way up the much later constructed staircase to a couple of upstairs rooms which would have been primarily used as bedrooms. It was a truly fascinating and very informative day. 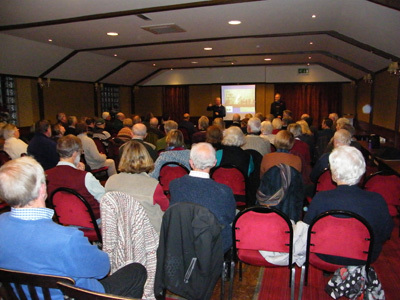 On Thursday 21st February the Dartmoor Society in conjunction with Yelverton and District Local History Society arranged a unique event in the form of a ground-breaking presentation for over 90 people, courtesy of Plymouth born and bred Professor Bob Stone and his team from Birmingham University entitled “Making the Invisible, Visible” held at Meavy Parish Hall. By using Human Interface Technologies (HIT) the team has been focussing on a number of high-tech Research and Development projects in the Plymouth area as well as on Dartmoor since 2003. More specifically Bob explained about their work using a Multi-Purpose Unmanned Surface Vessel (MUSV) where they have been able to carry out the first ever high-tech underwater survey of Burrator Reservoir. After Bob’s presentation all the audience enjoyed using the headsets and experienced amongst others “virtually” walking on the deck of the Mayflower ship which of course originally set off from Plymouth to America in 1620. Using these Virtual Reality headsets was a first for many of our attendees. 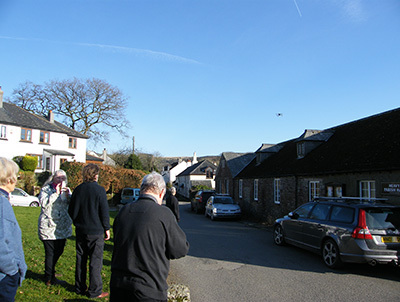 Later on Bob took an aerial photograph of everyone outside on Meavy Village Green using a drone on its inaugural flight with a Hasselblad lens in what can only be described as perfect conditions. The afternoon was rounded off with an excellent tea provided by the Dartmoor Society Executive Committee. 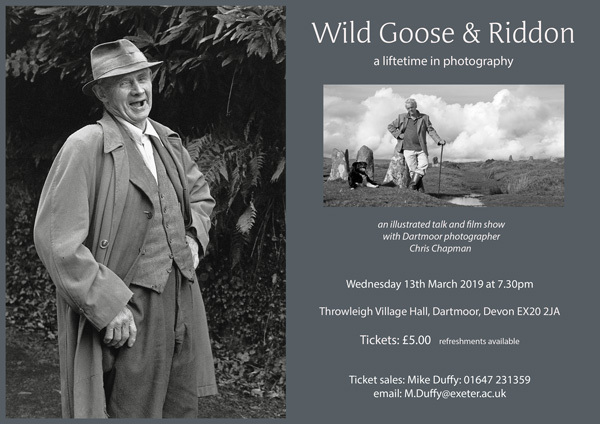 Renowned Dartmoor photographer Chris Chapman is doing several illustrated talks over the next few months – details below. 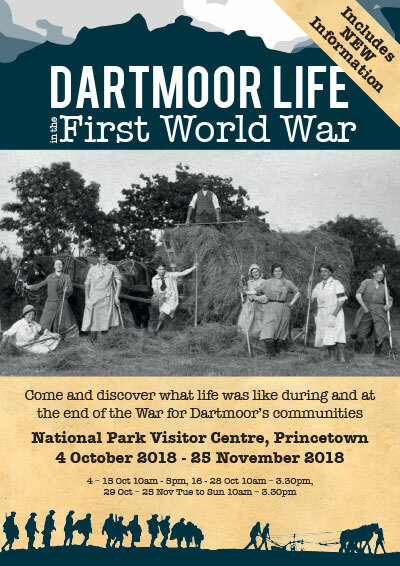 The National Park Visitor Centre in Princetown is currently hosting the “Dartmoor Life in the First World War” Exhibition. It has doubled in scope since 2015, with more information gathered from throughout Dartmoor and the surrounding area. The exhibition is open Tuesday to Sunday betwen 10am and 3.30pm and finishes on 25th November. In addition, on 7th November, Chris Hoban will present his 1918 Tribute song cycle which includes “No Parades”, “The Padre” and “The Lily And The Rose”, followed after the interval by a participation reverie of songs from the trenches. The performance will be at the National Park Visitor Centre, Princetown. Doors open at 7pm for 7.30pm and the event will finish at 9.30pm. There are only 70 seats, so booking is essential. Tickets cost £10. There will be a bar and there is plenty of parking. Our Dartmoor Society Members had an absolute treat on Wednesday 19th September 2018 when we had three fascinating visits in one. The theme of this event was to learn about the locality of where Sabine Baring Gould lived and worked, and where better to explore this subject than the very beautiful village of Lew Trenchard. 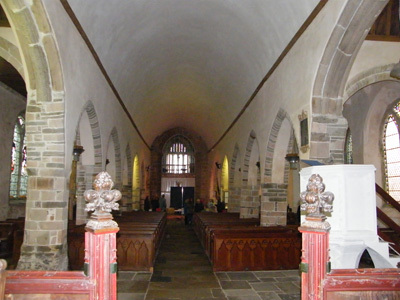 We started off having an interesting tour of the Parish Church of St Peter which was where Sabine held the position of both the Rector and the Squire in the Village. We also visited the Forgotten Garden which was originally established for Sabine’s wife Grace to give her somewhere pleasant to walk to help her exercise whilst fighting Arthritis later in her life. Finally, we had a tour of the very beautiful Coombe Trenchard Manor which was originally part of Sabine’s Estate and has been lovingly restored by Philip and Sarah Marsh. This event proved to be a true feast providing both historical content and beauty combined and was thoroughly enjoyed by everyone. 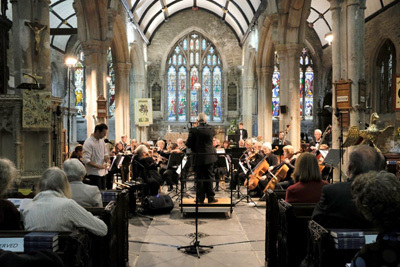 The Dartmoor Society has now published a full report on the Dartmoor Resonance Music Festival. You can download it in PDF format below. If you do not have a PDF reader you can download a free copy of Adobe Reader. On Tuesday 11th September 2018 the Dartmoor Society was delighted to attend Widecombe Fair. Despite the weather being rather windy and quite showery at the start, the day actually settled quite nicely enabling everyone who attended to enjoy all the stalls and exhibits as well as doing plenty of socialising. We are delighted to report that “Uncle Tom Cobley” was there, as well as plenty of exciting things to watch in the Main Ring such as the “Dartmoor Hill Pony Display Team”, and a fascinating “Vintage Machinery and Farming through the Ages Demonstration”. We would like to give special thanks to everyone who visited our stand (no. 4), both Members and non-Members alike, and who made it such a special and enjoyable occasion. On Wednesday 22nd August 2018, 32 Members congregated at the superbly situated Corringdon Farm near South Brent courtesy of our hosts Philip and Charlotte French. The Farm is located 220 metres above sea level and considering how high up we were and the fact that the weather forecast was a bit changeable we were all greatly relieved that the afternoon stayed mainly dry; despite a light mist which formed, especially when we reached the highest spot which was in the area of Corringdon Ball. On the way there Philip gave us a wealth of information about the Farm and the surrounding area as well as a fabulous insight into the economics and methodology the Family uses in the running of a Dartmoor Hill Farm. After enjoying Philip’s tour of the Farm and walking over some of the Family’s 650 acre holding of land it was fair to say we had all worked up a healthy appetite and so we were all delighted to sit in their barn and enjoy Charlotte’s tea and coffee as well as tucking into home-made sandwiches and cakes prepared by the Dartmoor Society Executive Committee. On Thursday 16th August 2018 was the 118th Chagford Agricultural and Horticultural Show and as usual it offered a unique mix of farming, crafts and horticulture. After a wet start the weather improved to offer a day of bright sunshine and a soft breeze so this helped to encourage an energetic vibe with live music playing and an opportunity to watch step dancing. In addition there was plenty going on in the Main Ring such as the judging of Heavy Horses, as well as Terrier racing and this year there was even Camel racing. 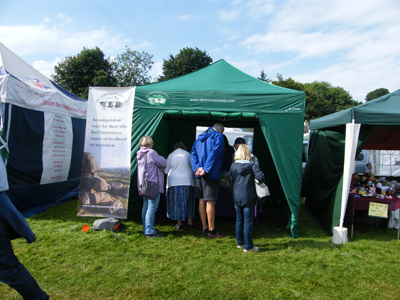 The Dartmoor Society would like to thank everyone, both Members and non-Members alike who visited our stand, No 28 in Area A – your support is greatly appreciated. A day event, hosted by the Dartmoor Society, was held on Gidleigh Common and at Gidleigh Village Hall on Wednesday 18 July 2018. Its primary purpose was to explore and discuss the state of vegetation on Gidleigh Common now, some 24 years after maps were prepared by English Nature (now Natural England) showing vegetation cover, condition and impact by grazing animals, in 1994. You can download and read the report from the day below. The conditions could not have been more perfect for 28 Dartmoor Society members when we arrived at Okehampton Camp at 9am sharp on the morning of Wednesday 6th June 2018. It was no surprise to us that our day had been arranged with complete military precision from the provision of car passes and somewhere for us all to park, refreshments on arrival and a first-class slide presentation provided by Lt Col Crispin d’Apice. This was ably followed by a fascinating tour of the Camp itself conducted by LT Col (retired) Tony Clark OBE who showed us the original horse stables, the old artillery Guard House and much more. After this we were introduced to Mark Bullock who showed us around the Camp Museum before we set off walking up to OP22 ably led by Paul Fletcher. We were given a fascinating insight into the procedures involved with a military training firing day and the views were absolutely spectacular. Also, on the North Moor Willsworthy and Merrivale Ranges are used and on the South Moor dry training is conducted on Cramber Tor, Ringmor and Sheeps Tor. This special visit was arranged to commemorate the final centenary year of the First World War and it was an absolute treat to be given such an in-depth insight into the special role the Military play in this unique place we call Dartmoor. On Saturday 14th April 2018, 31 members of the Dartmoor Society attended the Society’s 20th AGM at Belstone Village Hall. The day dawned bright and sunny, and Belstone Village really looked at its best. Our Chairman Dr Tom Greeves gave a fascinating presentation entitled “A review of our first 20 years”, looking back over the activities and achievements of the Society since its creation in 1998 and with the use of slides was able to highlight all the key events since the Society’s conception. After the main business of the AGM, which included the formal election of the Committee Members, the Dartmoor Society Award was presented to Rosemary Howell from Lukesland Gardens. The afternoon was rounded off with a raffle and a sumptuous tea which included a special celebratory 20th Anniversary cake. This visit on Wednesday 7th March was truly very special and all our Members thoroughly enjoyed it, especially considering the extremely cold, snowy conditions everyone had been enduring a few days earlier. It was so wonderful to get out and about walking in the early Spring sunshine enjoying the best scenery Dartmoor could possibly offer. We started off at the very beautiful 17th Century Fingle Bridge with our expert guide from the National Trust, Tom Wood, and headed along a very dramatic River Teign towards the Hydroelectric Power Plant to see the two highly efficient turbines installed by Gilbert Gilkes and Co.
As with Castle Drogo itself, the building they are housed in was designed by Sir Edwin Lutyens and Tom explained everything to us – not just the History and the flora and fauna of this stunning location, but also how all the machinery worked in conjunction with the Castle. On the way back we stopped at the “Teign Logan” which in its time had been the “Number 1” Tourist attraction for Dartmoor. Dr Tom Greeves treated us to a couple of fabulous quotes which truly brought the whole location to life. All our Members agreed this event had been a real treat. 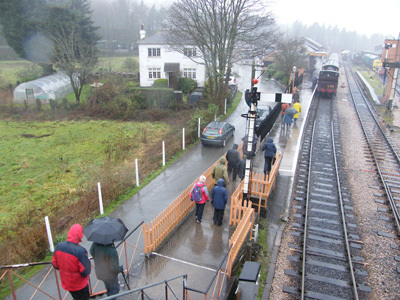 Despite the very inclement weather that greeted our Members at the South Devon Railway on the afternoon of Wednesday 14th February it certainly didn’t dampen our spirits as we all set off for a fascinating walk around the town of Buckfastleigh led by our hosts John and Maureen Tuffnell. The town is primarily known for its woollen, leather, mining and quarrying industries and in fact in 1838 there were over 700 looms operating in the town before it became mechanised. 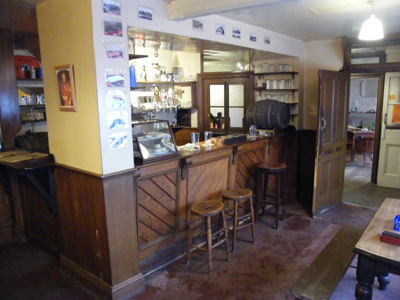 Our tour also included a totally absorbing visit to the Valiant Soldier Public House and Museum which is beautifully preserved, and it felt like we were completely stepping back in time. The whole afternoon was rounded off with some very welcome tea and home-made scones and cake in the South Devon Railway Refreshment Rooms. The Devon & Cornwall Record Society are holding a celebration of the archival work in Devon of the Dartmoor Society’s chair Dr Tom Greeves, in conversation with Dr Todd Gray. The event is called ‘Desert Island Documents’ and more details can be found in the attached flyer. 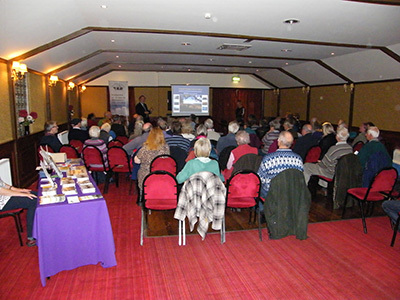 On the evening of Friday 10th November, 75 attendees congregated in the Dolphin Suite at the Dolphin Hotel for our Annual Research Lecture. The audience, consisting of both members and non-members, enjoyed a presentation by Martin and Shan Graebe who told the story of Baring-Gould’s journeys across Dartmoor in the late 19th Century and who from the age of 17, travelled in search of folk songs. Martin described the men and women that he met and both Martin and Shan sung beautifully the songs that he found. 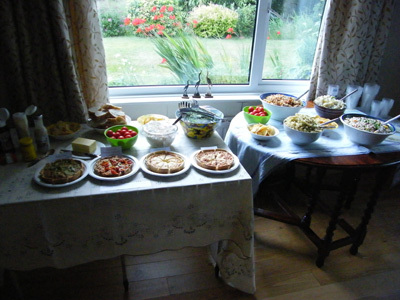 The whole evening was rounded off by an appetising buffet supplied by Robert and his catering team enabling everyone to socialise. It was also an opportunity for people to buy Martin’s new book entitled “As I Walked Out, Sabine Baring-Gould and his search for Folk Song in Devon and Cornwall”. It was a truly unique and special evening that everyone thoroughly enjoyed. 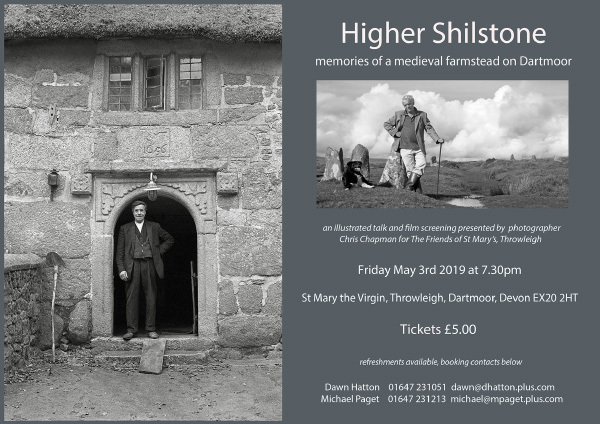 Peter Mason has kindly forwarded details of a forthcoming exhibition people may wish to visit that he has been co-curating, called “Dartmoor: A Wild and Wondrous Region”. The exhibition is in Gallery 21 at the Royal Albert Memorial Museum (RAMM) in Exeter and runs from 22nd December 2017 to 31st March 2018, open Tuesday to Sunday between 10am and 5pm. The Dartmoor Society debate this Saturday has been cancelled due to weather warnings from Met Office. Chairman Tom Greeves writes: ‘In view of the severe gales forecast for Saturday (21st) and the weather warning put out by the Met Office, and having sought other advice, we regretfully think it prudent to postpone our Dartmoor Society Debate on ‘Are We Using Dartmoor's Stone Resources Wisely?’. ‘We are mindful that a good many speakers and participants would face long journeys in potentially hazardous driving conditions. With apologies for the disappointment and any inconvenience, we thank you all for your interest, and are of course happy to reimburse all those who have booked places. ‘Our plan will be to reschedule the Debate for sometime in October 2018, and we will be in contact with you all before then’. 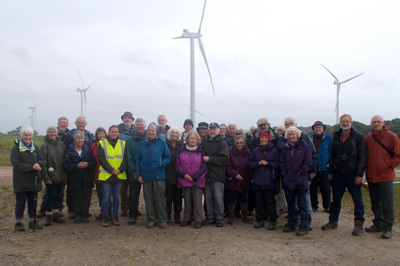 30 members of the Society had a fascinating visit to the Den Brook Wind Turbines near Bow on 27 September. 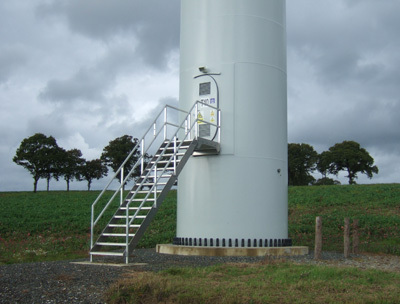 Nine turbines, 120m in height to the tip of their three blades, are spaced over an extensive area of farmland with grazing sheep and cattle. 18MW of electricity are fed into the National Grid through a substation (the only building on site). The site is managed from Glasgow and Exminster! Buzzards wheeled among the turbines which emitted a low hum and whooshing sound. The course of a Roman road crosses the site as does the railway line between Okehampton and Exeter. There will be a full report in the February Newsletter. 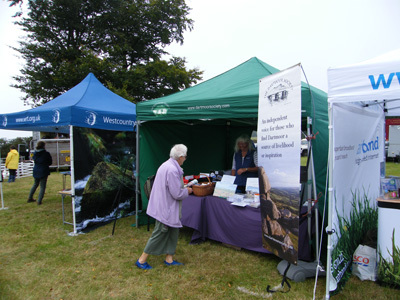 A very BIG thank you to everyone who visited the Dartmoor Society stand and who helped make our attendance at Widecombe Fair on Tuesday 12th September 2017 such a successful occasion. In total there were over 80 individual stall holders and as ever there was plenty going on in the demonstration ring, as well as the judging of animals and vintage vehicles on show, plus many more activities in the area of the Village Green. 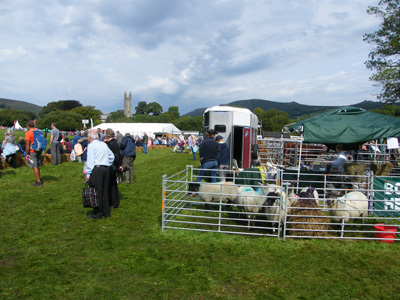 We also felt very fortunate that the weather stayed mainly dry and this enabled people to sit and socialise and take in the special atmosphere generated at this annual show. It was clear to see that both locals and visitors thoroughly enjoyed this truly unique Dartmoor experience. Many thanks again one and all and roll on next year! 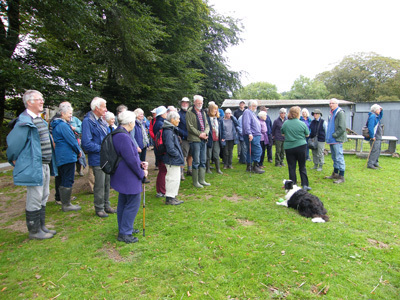 A record 49 Members attended our annual farm visit to Pizwell Farm which is one of the 17 Ancient Tenements of the Forest of Dartmoor. Sue Martin did a fabulous job of showing us around both the historic and more modern farm buildings and explained about their various uses. 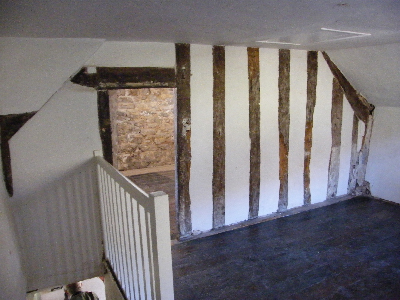 The Old Pizwell Farmhouse which is a Grade 2 listed building also aroused particular interest. After this, Frank led us on a spectacular walk across Riddon Ridge where we thoroughly enjoyed the amazing panoramic views. At the end of the afternoon we all tucked into a wonderful afternoon tea consisting of different varieties of rolls and sandwiches and home- made cakes and copious amounts of tea giving everyone a splendid opportunity to socialise in Sue and Frank Martin’s Farmhouse Garden. On the evening of Friday 14th July Dartmoor Society Members and friends all enjoyed our Annual BBQ held at Heron’s Brook, South Zeal. 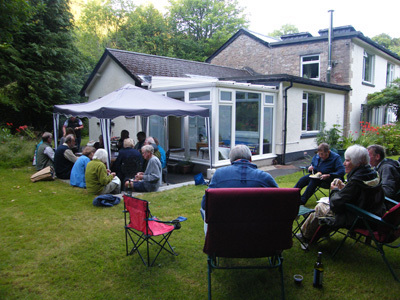 This was the second year the BBQ had been held at this venue and our hosts Helen and Wilfrid Hodges did us proud. 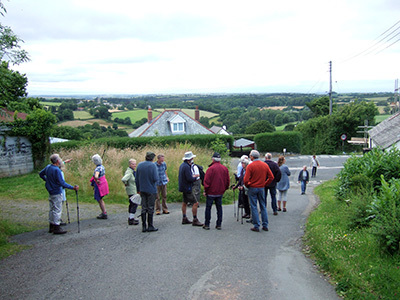 Wilf led a totally different walk showing our members a variety of historical Dartmoor features and the cooking of the sausages and the beef burgers was ably organised by Barry Welch. The rest of the catering was prepared by Elisabeth Greeves, Helen Hodges, Tanya Welch and Caya Edwards. The weather was superb and this ensured everyone was able to maximise on this thoroughly enjoyable and social occasion. 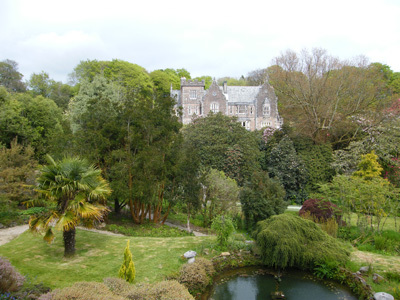 On Friday 5th May twenty-three members thoroughly enjoyed a wonderful Spring day visit to Lukesland Gardens at Harford. 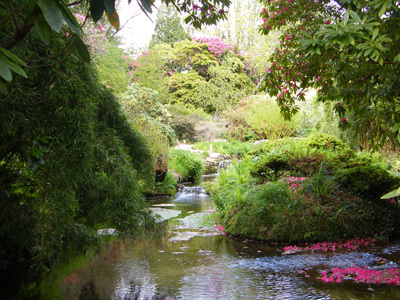 The gardens are owned by Rosemary Howell who is ably assisted by her son, John and his wife Lorna. The weather was perfect with partial sun and clear skies and the beautiful colours of the Camellias, Rhododendrons, Azaleas, Magnolias and a wealth of internationally sourced trees made it a truly unforgettable experience. The Lukesland Estate consists of a total of 24 acres and rather amazingly the gardens are maintained by members of the Howell Family and only two part-time gardeners. Due to spasmodic flooding from the Addicombe Brook which flows through the Estate in a North/South direction there has been a certain amount of remodelling in the garden where we thoroughly enjoyed seeing the Brook cascading over various waterfalls and filling ornamental pools before eventually joining the River Erme. At the end of the afternoon we all congregated in the “Old Billiard Room” for a very welcome cup of tea and a slice of homemade cake. Everyone agreed it had been a very special visit and is without doubt one of Dartmoor’s best kept secrets. On the afternoon of Saturday the 22nd April 2017, 30 Dartmoor Society members congregated at Yelverton Memorial Hall for the 19th Annual General Meeting. Before the business proceedings, Tom Stratton, Deputy Land Steward, Western District, Duchy of Cornwall presented on “Managing the Duchy of Cornwall Estate on Dartmoor”. 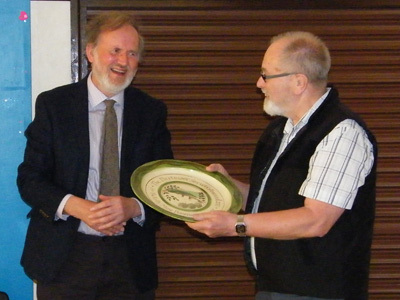 At the close of the AGM business the Annual Dartmoor Society Award 2017 was presented to John Tuffnell, Treasurer of Kelly Mine Preservation Society based near Lustleigh. The mine closed in 1951, however since 1984 a small group of dedicated volunteers have worked tirelessly, year in year out, to carefully conserve, maintain and restore it to its present day first class condition, ensuring that it is now one of the finest examples of preserved rural industry of its kind in the country. At the end of the afternoon we all tucked into a delicious tea prepared by the Executive Committee giving everyone a chance to eat, drink and socialise. 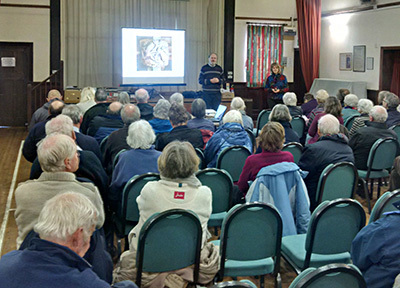 Our Dartmoor Society Members were given a treat on the afternoon of Tuesday 29th March 2017 when Dr Sue Andrew presented a talk at St Peter’s Church Ugborough entitled “Facing Sin, Roof Bosses in Ugborough Church”. 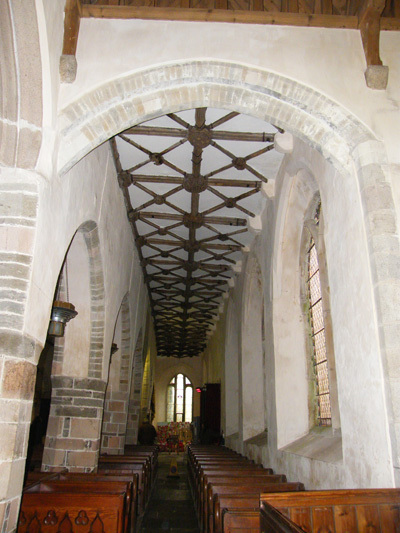 The carved oak roof bosses in the North Aisle are among some of the finest in Devon and although the bosses are not structural they do offer a sense of completion to the ceiling. Sue had taken numerous photographs of these bosses and even had the advantage of getting right up close to them during a period when scaffolding had been erected whilst the North Aisle was being repaired. Sue had also taken photographs of stained glass windows and bosses in numerous other Churches. Her talk gave us a significant insight into the Medieval period and it clearly demonstrated how the Parishioners of that time were left in no doubt as to what would happen to them if they died unrepentant. After Sue’s talk we walked slowly down the North Aisle with the use of a beautifully hand- made mirror-on-a-trolley and we also used our own torches and binoculars which assisted us whilst we studied the bosses in situ. Everyone agreed it had been a thoroughly fascinating and absorbing afternoon. 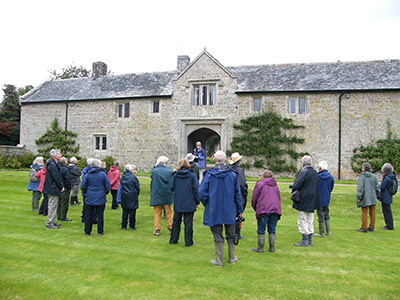 On Saturday 17th October 2015 the Dartmoor Society arranged a visit to Langaford Farm Trust and we were graciously hosted by Ces Hoult. Sadly in December 2016 she passed away and the Trustees of Langaford Farm are hosting a special tribute to Ces and everyone who knew her are warmly welcomed to attend. 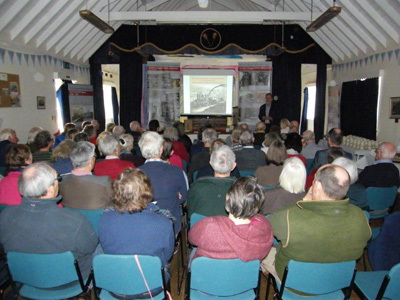 72 people consisting of both members and non-members gathered at Postbridge Village Hall on the afternoon of Saturday 18th February to hear Dr Tom Greeves do an excellent talk on tin mining and miners of the Postbridge area. Tom provided us with a wealth of information focussing on the men, women and children who lived and worked in the Mines and the small settlements in the surrounding area. Tom also showed us a wealth of historic photographs and brought the whole mining story to life by naming some of the people in the photographs as well as describing their background and the story behind the faces. After our fascinating talk, we all tucked into a delicious tea provided by the Dartmoor Society Committee Members thus giving everyone an opportunity to socialise and to buy books as well as other merchandise. 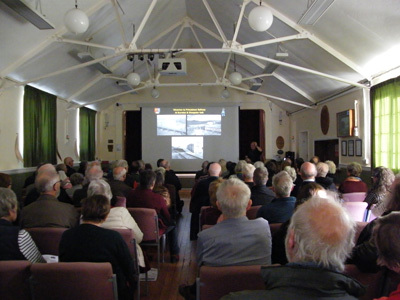 Over 80 people, both members and non-members, attended this year’s Dartmoor Society Research Lecture entitled “The Dartmoor Conchies” – Dartmoor Prison’s Conscientious Objectors of the Great War, presented by Simon Dell MBE. Simon gave us a truly fascinating insight on the subject and included themed war posters from the era as well as many authentic photographs of Princetown Prison and the surrounding area which brought this important story to life. Simon has researched material on the “Conchies” for over ten years and the culmination of all this work is to be presented with the launch of his new book which is taking place in March 2017 at the Dartmoor Prison’s Museum. After the talk everyone socialised whilst tucking into a delicious buffet spread, ably provided by Robert and his team at the Dolphin Hotel, Bovey Tracey. It was truly a very memorable evening. 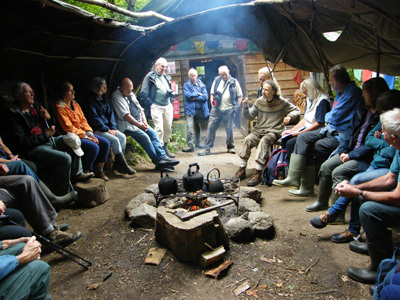 Dartmoor Society Debate - "Return to the Wildwood? 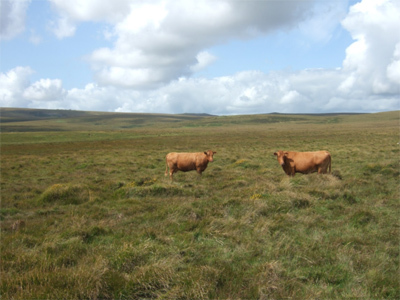 Is Rewilding the future for Dartmoor?" 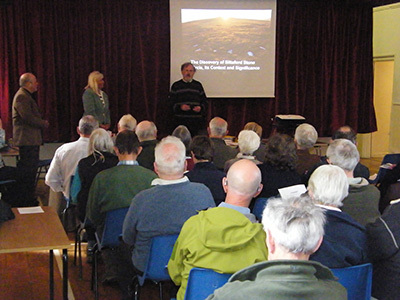 It was a first for the Dartmoor Society on Saturday 29th October when a record 116 people attended a very special Dartmoor Society Debate entitled “Return to the Wildwood? 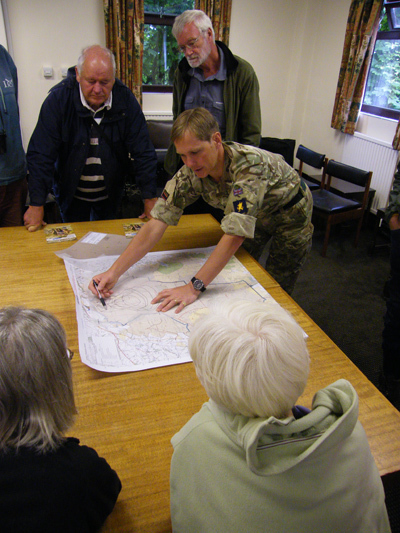 Is Rewilding the future for Dartmoor?” at Meldon Village Hall. Matthew Kelly, author of “Quartz and Feldspar”, was our Chairman for the day and did a fantastic job of introducing and summing up speakers as well as inviting people to either make comments or observations. Our excellent speakers included Robert Cook; Lecturer in Education for Sustainability, Plymouth University “Just How Wild Should We Be?”; Ann Willcocks; Dartmoor Farmer and Commoner “Why Bother”; Peter Taylor who has written a book entitled “Beyond Conservation” where he used Dartmoor as an example for possible rewilding. Finally our very own Chairman Dr Tom Greeves; Cultural Environmentalist presented on “8000 years of culture in an upland environment ­ the elephant in the room?”. A fabulous lunch was supplied by “The Original Pasty House” in Tavistock and tea was supplied by the Dartmoor Society Committee. There was a varying wide range of views on the day and the subject was analysed from a number of angles including “What might be the result if trees replaced open moorland or cultivated fields?”, “How would Dartmoor’s farming culture change, and how have recent conservation strategies already forced farmers to adapt to a form of rewilding?”. The weather was a beautiful Autumnal day which meant that in the break times everyone was able to retreat outside and enjoy the stunning Dartmoor air and views. Everyone agreed that it had been a truly stimulating, educational and thoroughly enjoyable day. 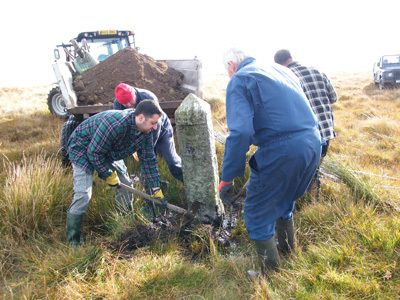 On Tuesday 18th October 2016 seven eager Dartmoor Society volunteers, namely Tom and Elisabeth Greeves, Barrie Quilliam, Tanya and Barry Welch who brought along some of their tools, Simon Booty and Alex Booty who kindly brought their Land Rover as well as some tools, all met at the start of the track to Nun’s Cross Farm. The purpose was to complete the conservation work relating to the three remaining PCWW (Plymouth Corporation Water Works) standing stones. Special thanks must go to Graham Colton for the use of his tractor and trailer and his tractor driver Mark Cole whose help was truly invaluable. 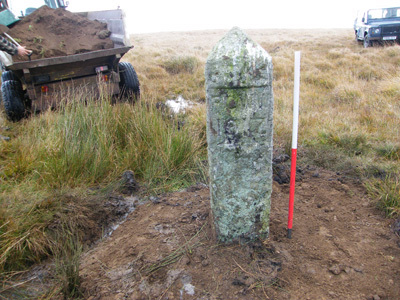 In 2017 it will be the 100th year Anniversary of the original erection of these stones and the Dartmoor Society felt that it was important to restore them to their former glory prior to their anniversary ensuring that they are all standing upright and not waterlogged, etc. Sadly due to the excessive rain we had all experienced over the previous few days it transpired that after reaching the third and final stone to be repaired, sited towards Eylesbarrow, both the tractor and trailer unfortunately got wedged in soft ground and proved to be totally stuck. A very special thank you must go to Simon and Alex Booty who went all the way back to their Farm at Sherril and then returned to the site with their own tractor and trailer to assist with the situation. After transferring the growan/subsoil from Mark’s trailer into the other trailer by hand and then attaching chains to the front of Mark’s tractor we were then able to gently pull Mark’s tractor and trailer to firmer ground. The Dartmoor Society is greatly indebted to everyone involved with this project, and thanks to the restoration work carried out on the PCWW stones on three separate occasions this important work is now complete. 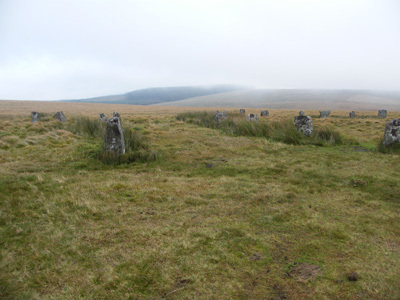 Next year the Dartmoor Society will be arranging a special walking event with the stones as the centrepiece in order to celebrate this vital part of Dartmoor history. Write-ups regarding the two previous work days are available under ‘Archives’ dated 27th October 2015 with an automatic link to the project day prior, which had taken place on 2nd October 2014. 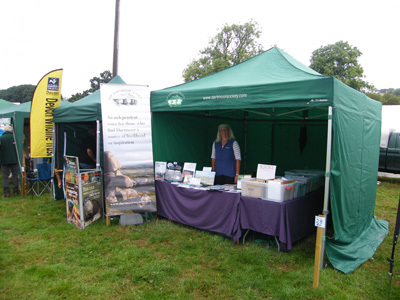 On Tuesday 13th September the Dartmoor Society attended Widecombe Fair with a stand and had a very successful day selling Christmas cards, Calendars, Mouse Mats, Pens, as well as new member subscriptions and a large range of Devon/Dartmoor related books which had been very generously donated by our Members. The weather can only be described as mixed with us all experiencing what can only be described as four seasons in one day, and there was even a large lightning strike from the direction of Top Tor. There was plenty going on both in the ring and on show and this year Adam Henson of Countryfile fame was also in attendance filming a report on the Dartmoor White Face Sheep. 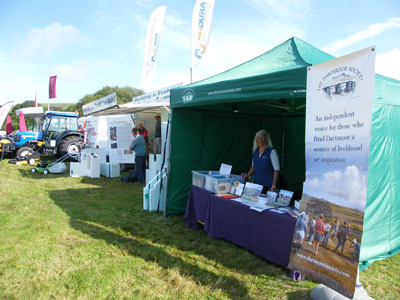 We would like to thank everyone who contributed towards the success of both Stands at Widecombe Fair and Chagford Show which had taken place previously on Thursday 18th August. Everyone’s support is greatly appreciated. 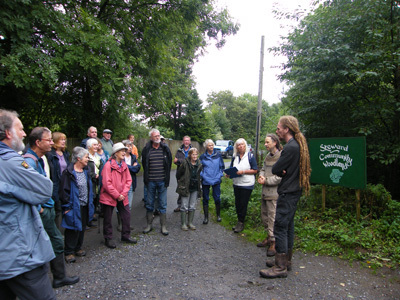 On Saturday 10th September 21 members enjoyed a thoroughly fascinating, visit to the Steward Wood Community, situated about a mile South of Moretonhampstead. It consists of 13 adults, 4 teenagers and 5 children, and their key aims are to demonstrate how a small dedicated ecologically minded group of people can enrich the social and natural environment of an area as well as being financially viable. Their houses are made from naturally produced products and are primarily constructed of timber with straw bales for walls with a layer of lime giving added insulation. Daniel gave us a brief history of the 32 acre site and we were shown all the key areas including the community growing area, the wash house/bath room, electrical power house set up and the “long house” communal area. He also explained about the various trees growing in their lush mixed woodland. After our tour we all sat by their communal fireside drinking tea and eating their home-made cake and discussing their future which is at present going through a rather turbulent period due to their recent application of permanent planning permission being refused. 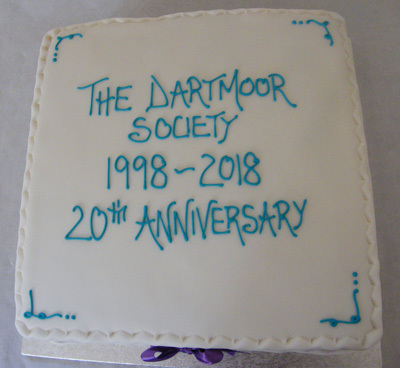 The Dartmoor Society wish them well for the future and in particular at their forthcoming Public Meeting taking place in Moretonhampstead Village Hall at 7.30pm on Tuesday 20th September. Going forward they will be encouraging support for their petition to the National Park Authority to help reverse their decision and one of their activities is a “march” to Parke. More information can be found about Steward Wood Community on their website. 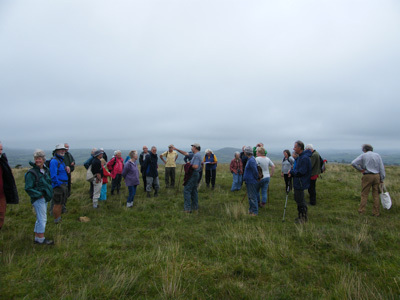 On the afternoon of Thursday 25th August, 37 eager Dartmoor Society members met at the elevated position of Pork Hill Car Park before setting off over Whitchurch Common on an excellent walk led by Mary Alford and her son Daniel. We had many highlights on our walk including the fabulous views from the Common itself where it was possible to see Pew Tor, Feather Tor, Heckwood Tor, King Tor, North and South Hessary Tors, Vixen Tor, Cox Tor, the iconic Brent Tor, the Tamar Bridge and Plymouth Sound as well as the Cornish Hills right in the distance. We also visited the Grimstone and Sortidge Leat, where the Bullseye Stone acts as a kind of accurate sluice for Mary And Daniel’s inch wide water supply, and Windy Post, which is part of the Abbott’s Way. The whole afternoon was rounded off with an amazing tea prepared by Mary and her helpers consisting of cheesy savoury rounds, home- made sausages, sliced cold beef sandwiches, various cakes, scones with jam and cream, “conservation sausages” and copious amounts of tea; all in the stunning grounds of Mary’s extensive garden. A wonderful time was had by all. 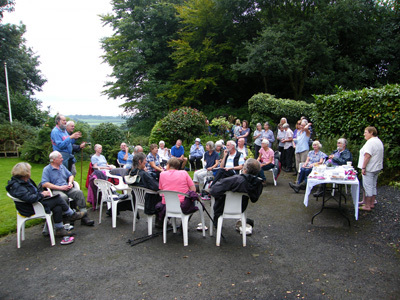 On a perfect Summer evening on Friday 15th July forty Dartmoor Society Members were welcomed to the home of Wilfrid and Helen Hodges for the annual BBQ. 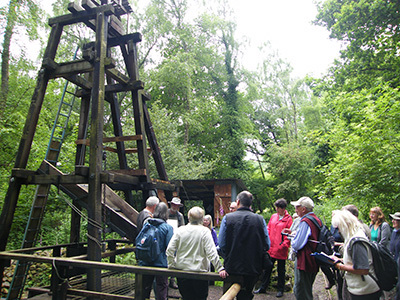 The event was started off by a fascinating walk led by Wilfrid in the area of Ramsley Mine. This gave everyone a chance to work up an appetite for a spectacular spread of food prepared by the Dartmoor Society Committee and friends, including homemade sausages, beef burgers, quiche, a wealth of different home prepared salads as well as a range of desserts. It was all enjoyed in the heavenly surroundings of Wilf and Helen’s extensive garden which also includes remains of the lower dressing floor of Ramsley mine itself. All these “ingredients” contributed to everyone having a wonderful occasion in very special surroundings. Kelly Mine is a unique example of an early 20th century mine with many original features and machinery. 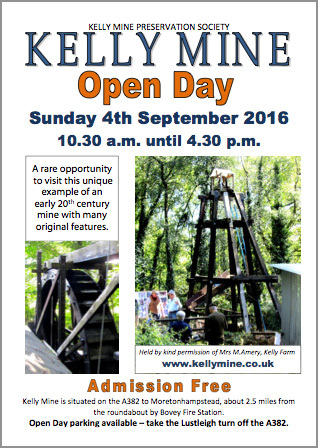 On Sunday 4th September the Kelly Mine Preservation Society is holiding an open day between 10.30am and 4.30pm. Admission is free. Light refreshments will be available. Mine machinery, stamps, ore washing strips and incline will be operating. 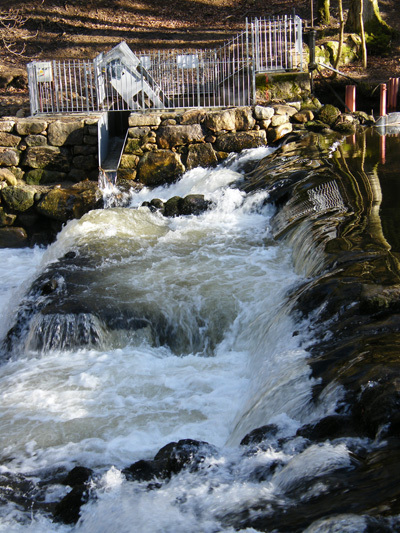 The water turbine and waterwheels will be run if water is available. Please note there are no toilet facilities on site and there is no vehicle access. Children and dogs must be closely supervised in the interests of safety. For further information please visit the Kelly Mine website. 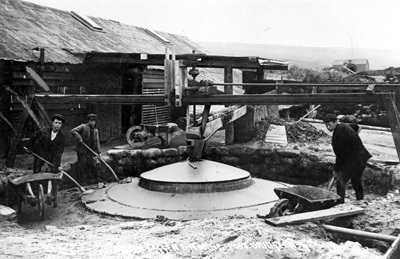 Kelly Mine is situated on the A382, about 500 yards from the Lustleigh junction, towards Bovey Tracey. Free parking will be provided in the Lustleigh show field. Turn off the A382 towards Lustleigh and the car park is 300 yards along the lane. Park at the far end of the field and follow the signs to the mine. There is one high stile and a stream to cross. Less agile passengers can be dropped off on the main road by the mine. 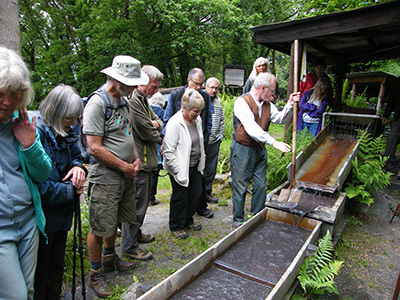 The Dartmoor Society had a real treat on the afternoon of Thursday 9th June when twenty five of our Members were privileged to enjoy a private tour of Kelly Mine conducted by Nick Walters. We met at Trenchford Reservoir Car Park and walked down to the mine via Bullaton Farm. We were all given a fascinating insight into both the mining process and the hardships the Miners and their families endured during the working mine’s history. The miners’ objective was to extract micaceous haematite or shiny ore and one of its major uses was in the production of making very effective corrosion-resistant paint. Nick showed us the whole site and we were able to follow the various processes from mining the ore, via the adit and the shaft, through the ore washing, jigging and stamping, right up to the final process of drying the precious powder before loading it into barrels for transportation. The real star of the show was seeing the amazing original Californian stamps in full working order. A fabulous afternoon was had by all. 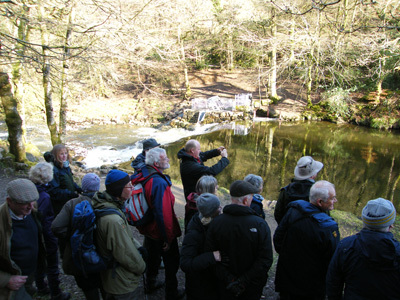 On Wednesday 18th May the Dartmoor Society welcomed 26 Members and their guests at Fingle Bridge Car Park where everyone enjoyed a fantastic walk led by David Rickwood, Manager of the Dartmoor Woodlands for the Woodlands Trust. The skies cleared so that we were all able to enjoy some very welcome warm sunshine whilst we walked and also experienced both the historical and very beautiful surroundings. 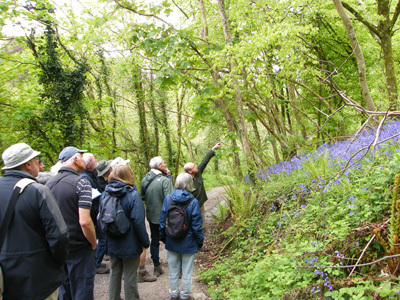 At present the woods are undergoing extensive restoration management and all the attendees had the benefit of seeing the Spring growth on the trees and all the flora just bursting into life. Everyone agreed it had been a truly spectacular afternoon. 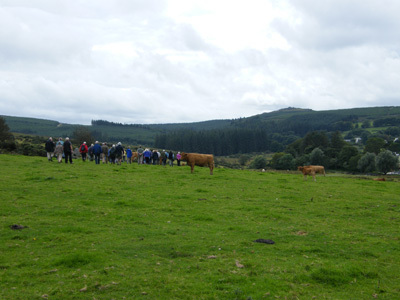 Wednesday 15th June – Farmers and Foresters. 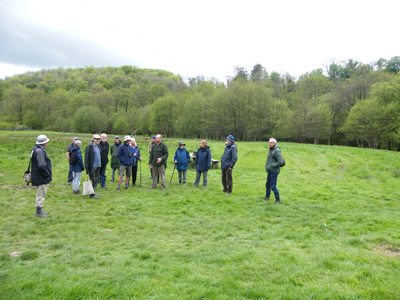 Thursday 16th June – Conservationists and Ecologists. 0900 – Register at the Barn, teas and coffees. 1000 – Introduction in the Barn, form groups for field work. 1400 – Meet in the Barn, demonstration and practical texturing followed by Q&A, teas and coffees. Entry is £10 and refreshments will be provided by Devon & Cornwall Food Association. For more information please phone 01803 614316, email jmlangaford@gmail.com or visit the website. On Saturday 23rd April 2016, 63 members attended our 18th Dartmoor Society Annual General Meeting. We were all enthralled by his findings and at the very end of the meeting we all tucked into a sumptuous tea prepared by the Dartmoor Society Executive Committee and enjoyed some all-important socialising. 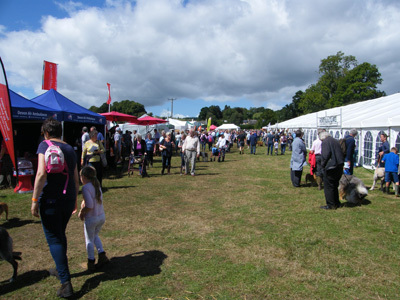 We are pleased to announce that the Dartmoor Society will this year have a stand at Chagford Show which is taking place on Thursday 18th August. We will also be attending Widecombe Fair which is taking place on Tuesday 13th September. We will be delighted to see everyone attending these shows so please look out for us, do visit us on the stand to have a chat as well as enjoying all the other exhibits. See you there. 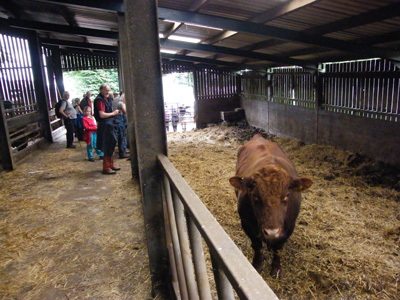 This event was a rare occurrence for the Dartmoor Society where the cheese factory at North Tawton very graciously assisted us by kindly arranging two separate dates for two simply fascinating tours in order to accommodate everyone who expressed a wish to attend this interesting local dairy producing company. The Taw Valley Creamery are part of a farm co-operative known as Arla which makes them a contributor to the UK’s largest milk producing pool with a turnover of £2.2 billion. Their product range includes cheese, whey, cream, butter, whey permia concentrate (WPC) and milk powder. 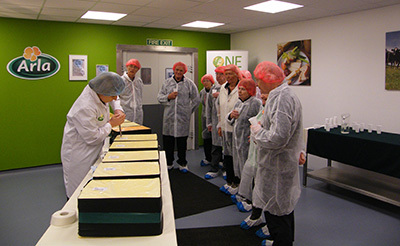 After an informative formal presentation, a full tour of the production facilities, a comprehensive cheese tasting, as well as a visit to the factory shop, everyone agreed it had been a truly wonderful event. 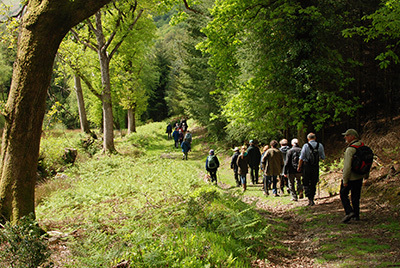 On Saturday May 7th at Lydford Village Hall The Lost Sound Chorus will give a concert in mixed acapella style to include their own film of the coffin road Old Lych Way, with their very own song The Old Lych Way, written by a local composer called Chris Hoban. The concert will comprise sixteen different songs and tickets will be available through The Lost Sound Chorus website. Book now for this excellent event. On a very chilly afternoon on Wednesday 10th February fifty-five people consisting of both Members and non-Members of the Dartmoor Society eagerly gathered in the Nicholls Hall, Lydford for a talk and and a visual presentation delivered by Dr Sue Andrew entitled “The Three Hares – A Curiosity Worth Regarding”. This project involved our Chairman Dr Tom Greeves in conjunction with much famed local photographer Chris Chapman as well as Dr Sue Andrew herself of course. Tom first came across the Three Hares motif fifty years ago and the quest for more information on this intriguing subject was born. After Sue’s excellent presentation the audience had a chance to ask questions and then tea and coffee, sandwiches and homemade cake were served. Everyone agreed that it had been a truly absorbing afternoon. 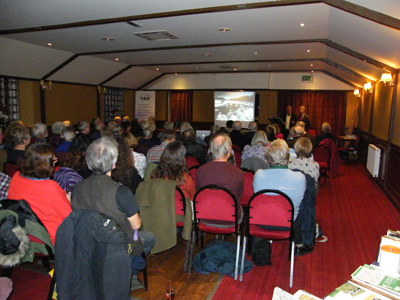 At 7pm on Friday 13th November 70 people, both members and non-members attended the 2015 Dartmoor Society Research Lecture at the Dolphin Hotel, Bovey Tracey, presented by Will Hand and entitled “Dartmoor Weather – Love it or Hate It”. Will Hand is a local meteorologist and has kept an amazing record of data relating primarily to the weather of the Haytor area, but he also offers on his website a weekly forecast for the wider Dartmoor region. Will first started recording data in January 2003 and one of the most interesting facts he has discovered over the years is that September is the driest month on Dartmoor. After Will’s excellent presentation the Dolphin Hotel provided us all with an admirable buffet spread enabling all the attendees to have a chance to socialise and discuss the wealth of data Will had communicated from his findings. Everyone agreed it had been a very informative and most pleasurable event. 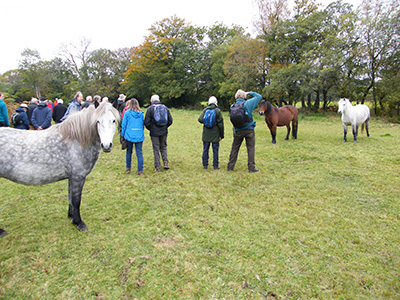 38 eager Dartmoor Society Members were introduced to the delights of Langaford Farm Trust on the afternoon of Saturday 17th October. Our host Ces Holt who is the Trust Manager, fellow Trustees John Mills and Dave Bunting all did a magnificent job of providing tea, coffee and biscuits on arrival and under the cover of the barn Ces gave us an introduction of how the Trust first started. It was founded in accordance with the Will Trust Deed of the late Geoffrey Bayes and then she went on to explain that it had been formally confirmed as a Charitable Trust in January 2002. 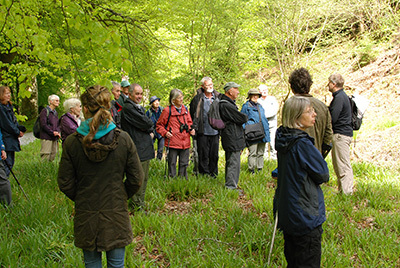 The main focus of the Trust is to maintain and encourage the ecological enhancement of its 100 acres of land and by working with various professional outside bodies, one of which is the Butterfly Conservation Council, they are able to encourage many rare and unusual species of flora, fauna and wildlife. The Trust is very proud to have won an award in 2011 in recognition of their contribution to Lepidoptera Conservation (Marsh Fritillary Butterfly). In addition, at the Farm, they have over 100 species of lichen, over 100 species of mosses and liverworts and over 100 species of moths. We all walked around the beautiful large pond areas and undulating fields and all agreed that the whole area had a special aura of tranquillity about it. There are 200 sheep belonging to a Tenant which graze at the Farm and four ponies, all Mares. We were even treated to see three roe deer who bounded their way off to the safety of the nearby wooded area. 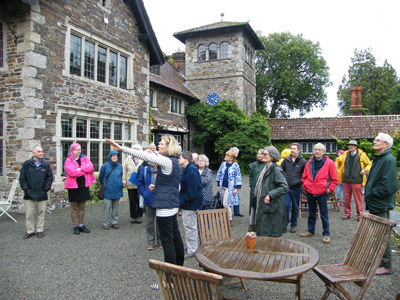 The whole afternoon was rounded off by assembling back in the barn where we had started our tour and whilst we enjoyed more refreshments kindly supplied by Ces and the Trustees we socialised and chatted about the delights of the afternoon. Our Chairman Dr Tom Greeves gave special thanks to Ces, John and Dave and everyone agreed it had been a truly enchanting experience. 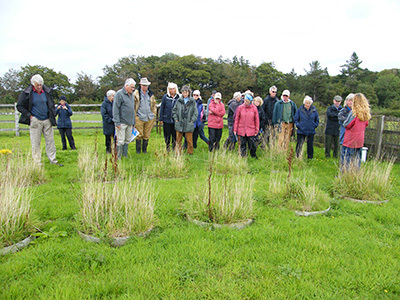 The Dartmoor Society were given a real treat on the afternoon of Wednesday 16th September when 31 Members were given a first class guided tour of North Wyke Rothamsted Research Centre. We were privileged to have a three for one experience where firstly Phil Murray commenced the tour by eloquently explaining to us about the North Wyke “Farm Platform” which through a number of regulatory processes they are ensuring global food security in the face of a changing climate. Then Deborah Beaumont gave a comprehensive overview of the “Environmental Change Network” programme where by doing extensive research combined with an integrated environmental monitoring programme using the weather as well as moths, bats, beetles, etc, they can both detect and interpret environmental change. 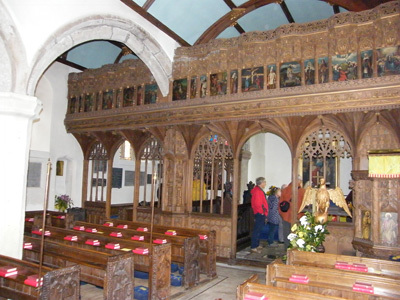 Finally Carol Newman gave us an excellent insight on the 800 year history and a comprehensive external and internal tour of Wyke Manor itself and although it is now used as offices, its beautiful oak panelling and well preserved interior decoration still prevails. During the afternoon we were also treated to coffee, tea and biscuits giving all our Members a chance to socialise. A wonderful afternoon was enjoyed by all. 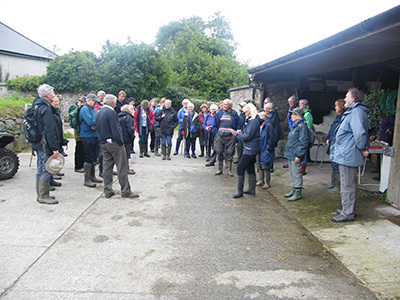 38 Dartmoor Society members were privileged to visit Moortown Farm on Wednesday 26th August. It has been farmed by the Jordan family for 100 years and we were all very warmly welcomed by John and Diane Jordan, their Son Robert and Grandchildren Charlotte and Jack. 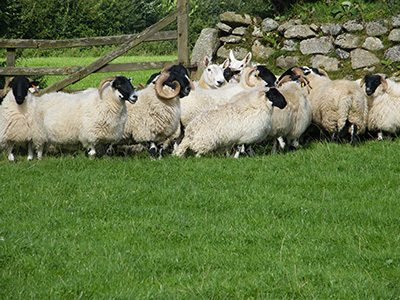 It soon became clear that a high level of attention to detail in the feeding and rearing of the cattle, ponies and the sheep is required to produce the top quality pedigree stock achieved by this long standing Dartmoor family. We were all delighted by the supreme condition of the Jordan’s pure breed Dartmoor ponies, Scottish Black Faced Ewes, North Country Cheviots, Grey Faced Sheep, Texel Sheep, South Devon Cattle and more. 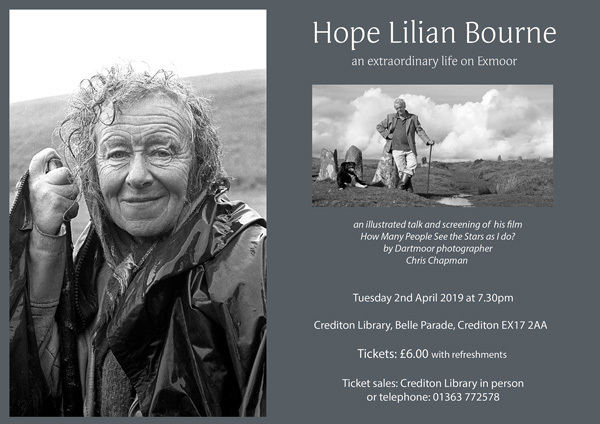 This fabulous event was rounded off by an excellent tea jointly provided by John and Diane Jordan and the Dartmoor Society Executive Committee. The Dartmoor Society is one of the sponsors of the Dartmoor Folk Festival, which will be held this year on the 7th, 8th & 9th August 2015 in South Zeal near Okehampton in Devon. There is a packed programme of concerts, ceilidhs, workshops, song and music sessions, a children’s festival, craft displays, folk service, a Dartmoor ramble and much more. For more information, including a full programme of events, please visit www.dartmoorfolkfestival.org.uk. 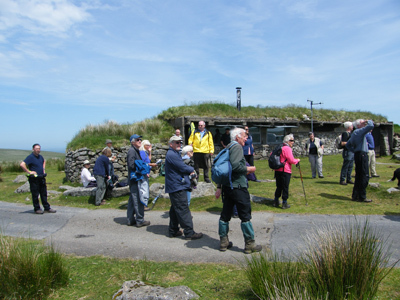 52 Members and guests attended the Dartmoor Society annual Barbecue and walk on Friday 17th July at Leusdon Memorial Hall. 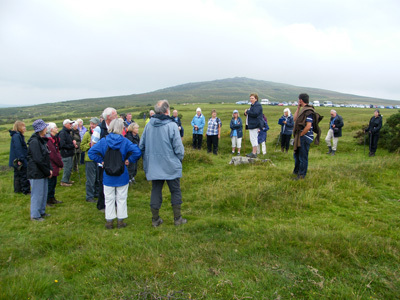 The event started with a thoroughly absorbing walk led by Dr Tom Greeves which commenced at Bel Tor Corner and even the heavy showers couldn’t dampen the spirits of those that attended. After Tom’s fascinating walk everyone re-convened at Leusdon Village Hall where Tanya and Barry Welch barbecued the very tasty hand-made sausages produced by Downing’s butchers in Tavistock and Elisabeth Greeves had worked tirelessly to produce a sumptuous array of additional buffet food which included seven different flavoured quiches, potato salad, pasta salad, rice salad, French bread and butter and a wide range of yummy desserts. Dr Tim Harrod who also attended the event kindly displayed his newly produced exquisite soil map of Dartmoor and the attendees were captivated by its content. All in all it was both a fascinating and truly enjoyable evening. 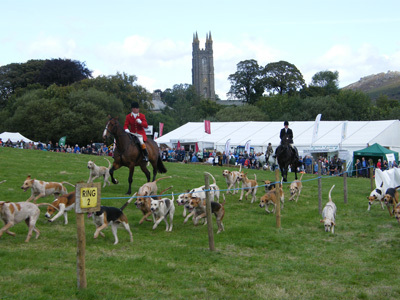 We are pleased to announce that the Dartmoor Society will have a stand at Chagford Show which is taking place on Thursday 20th August as well as Whitchurch and Sampford Spiney Sheepdog Trials taking place on Saturday 29th August. 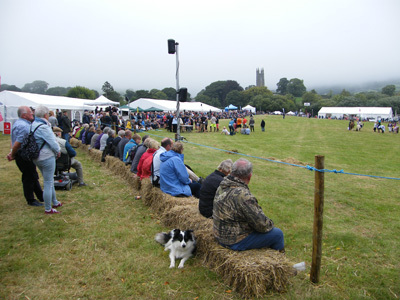 We will also be attending Widecombe Fair which is taking place on Tuesday 8th September. On Wednesday 13th May, 36 excited Dartmoor Society Members attended a very sunny and warm May meeting at Exeter and Teign Valley Railway, Christow Station, which is sited in part of the disused Christow Station goods yard, courtesy of a very kind invitation by Colin Burges. After a comprehensive introduction by Colin he left us to explore all the various photographs and railway features and exhibits such as his two unique Camping Vans which he has personally named “Toad” and “Tadpole” as well as his own exhibition, and the highlight of the afternoon a ride on Colin’s manumotive, electromotive, observation saloon called “Jenny Wren.” This had moments of great speed and was a very pleasurable experience to all who had a ride in it. The afternoon was rounded off by a lovely tea and homemade cake and plenty of socialising on what turned out to be a perfect afternoon. Many thanks to Colin for his hospitality and enthusiasm, keep up the good work! 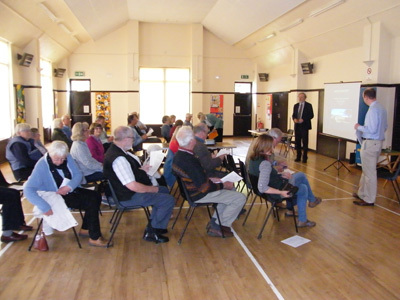 At 2.30pm on Saturday 25th April, 43 Dartmoor Society Members attended our AGM at Meavy Village Hall. To start off the afternoon we were all treated to a presentation by Jeremy Pyne Natural England’s Operations Manager for Devon, Cornwall and the Isles of Scilly Team. 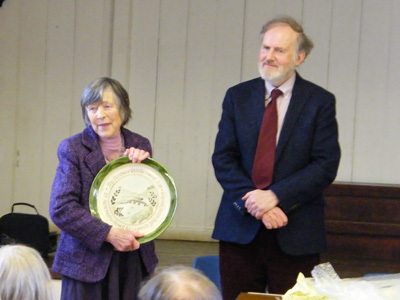 This was followed by a brief question and answer session and following the elections and formal proceedings Will Hand was presented with the Dartmoor Society Award, which is a unique specially commissioned ceramic plate made by a local potter and suitably inscribed by a local calligrapher saying “THE DARTMOOR SOCIETY AWARD 2015 - WILL HAND - FOR INNOVATIVE PRESENTATION OF WEATHER DATA”. At the end of the afternoon we all socialised and tucked into a scrumptious tea prepared by Lis Greeves and her team of helpers. 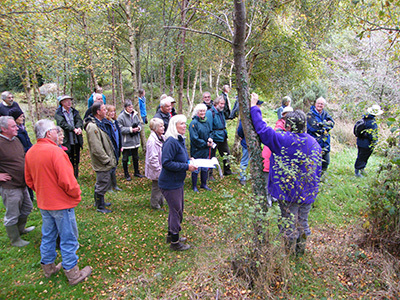 On Wednesday 25th March 2015 Gail and Miles Fursdon were our excellent hosts as they escorted 40 of our excited Members around their micro-hydro system which has been in operation since 1995. They both eloquently explained about their farming activities as well as walking us through their unique hydro system and gave all our Members the full history of the project. Everyone enjoyed this well attended event and the afternoon was rounded off with refreshments including homemade cake. There will be a full report on this event in the forthcoming June 2015 Newsletter. Another Dartmoor Society event enjoyed by 29 of our Members was a tour of the state-of-the-art British Ceramic Tile Factory, Heathfield, near Bovey Tracey. Our fantastic guides were Barry Derber and Steve Martin and after everyone donning high visibility waistcoats we were treated to a tour round the fully automated factory where we saw the whole tile manufacturing process in operation. There will be a full write up on this event in our June Newsletter (no. 53). A magnificent number of 50 of our Members attended this event on a blustery, cold January day and it gave everyone a fascinating insight on Medieval Moretonhampstead which included a tour of Dr Ian Mortimer’s house and a tour of the Church and this delightful ancient market town finished off with an excellent tea in the Union Inn. Following on from our very successful Dartmoor Society Pony Debate which had been held in October 2013 Robyn gave us a fascinating update on all her findings. This event had an excellent turnout with 98 attendees altogether and after the Lecture Robert Phillips and his staff at the Dolphin Hotel produced a very good buffet for all of us. There will be a full write-up on this event in our February Newsletter (no. 52). This was a very well-attended, extremely topical Debate with 70 people, some members and some non-members, enjoying this very informative event which took place at Meldon Village Hall. We had an excellent variety of speakers including Dr Tom Greeves, Bernard Mills, Richard Searight and Colin Burges. Our first class lunch buffet was supplied by the “Original Pasty House Company” from Tavistock and a wonderful tea was supplied by Lis Greeves and her helpers. An informative and enjoyable social day was enjoyed by all.